On 4th January 1880 Rev. James Owens, the Vicar, died aged 74. Rev. T. Thomas was his successor later that year. A surprise religious census in 1884 showed 31 attending morning service and 27 attending in the evening. On 20th May 1894 Emily Louisa Esther Thomas, daughter of Rev. T. Thomas & Mrs. Ellen Thomas, died aged 16. 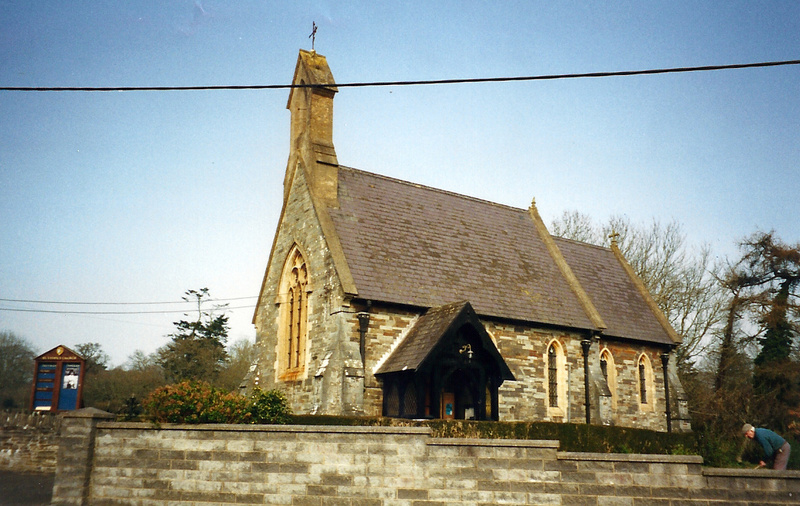 In 1899 the church was refurbished and redecorated. 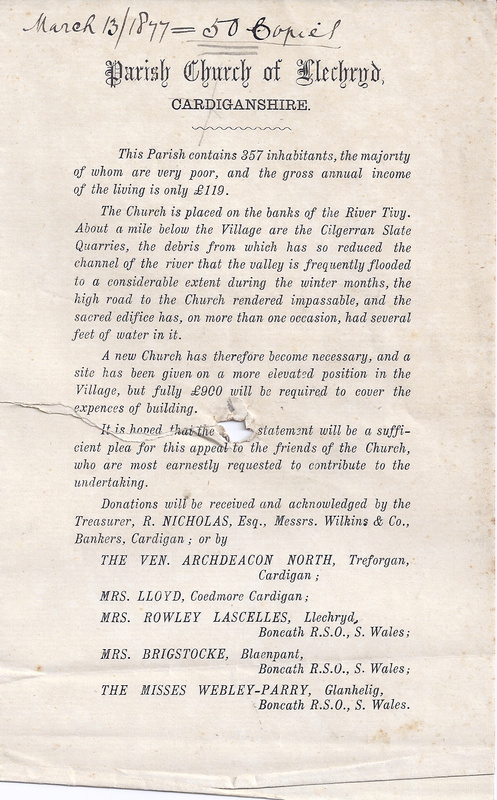 On 26th October 1900 tenders were sought for building a church parish room. The church was redecorated that year. On 13th May 1909 Rev. T. Thomas, Vicar of Llechryd, married Emma D. Ferrier, widow. On 17th April 1914 Rev. T. Thomas, the Vicar here since 1880, resigned from the post. On 5th July 1914 Rev. Isaac R. Morgan became the Vicar. In January 1922 Rev. Isaac R. Morgan left and Rev. J. R. James, B. A., became a temporary Vicar here. On 2nd June 1922 Rev. John Lloyd became the Vicar until 1932. On 13th January 1924 memorial tablets were unveiled and dedicated here. In 1926 there were said to be 100 sittings. Rev. John Lloydannounced his retirement on 12th February 1932 and on 7th May 1932 Rev. Arthur George became the new Vicar until at least 1944. 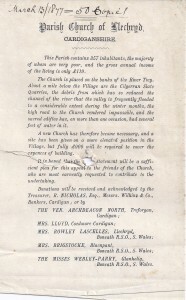 In May 1933 tenders were sought for painting and redecorating the church. In early 1934 electric lights were installed. At Easter 1939 there were 50 communicants. On 28th January 1948 Rev. Matthew Rice Lewis became the Vicar. On 19th April 1948 the Archbishop of Wales paid a visit. The church re-opened following renovations, which included new electric lights, on 1st October 1948. In 1948-56 Rev. Matthew Rice Lewis was the Vicar. On 8th May 1953 a Memorial Window was unveiled here to the memory of Mrs. Jacqueline Elizabeth Douglas, daughter of Admiral & Mrs. H. W. W. Hope of Glanhelyg. Rev. Matthew Rice Lewis, Vicar, left for Colchester in August 1956. On 22nd March 1957 Rev. Maldwyn Griffiths became the new Vicar. On 20th January 1960 Rev. Evan Tom Parry Morgan was inducted as the new Vicar of Llechryd and Llangoedmor. In August 1994-98 Rev. Michael Morris was the Vicar. On 7th January 1998 Rev. Michael Morris resigned as the Vicar. On 16th May 2004 Rev. Paul Robert Mackness became the Vicar. 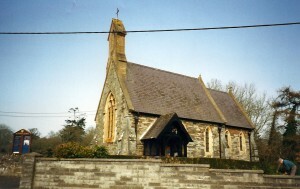 Anglican parish church of 1877-8 on a modest scale, coursed ashlar with sandstone dressings and traceried Gothic windows, steep pitched slate roofs with coped gables bearing cross finials. Three bay nave with tall sandstone bellcote to W gable, with lower 2-window chancel to east. Pointed headed bellcote has cross finial and tiled hood and shouldered base with pointed Gothic arched bell opening. West wall has large tripartite Gothic traceried window with projecting hood, pointed arch and traceried head. S wall has cast iron rainwater goods, gable-fronted timber porch with pierced sides and gable, bearing steep slate roof. Nave has to remaining bays, tall narrow pointed arched lancets, with smaller, similar lights to chancel.